Oh no! Red and blue flashing lights in the rear view mirror. What could you have possibly done wrong? You just hopped in the car for a quick trip to the store. You’re driving the speed limit, not blasting your music, using your blinkers. Did you remember to fasten your seat belt? No. May is Seat Belt Safety Awareness Month, and officers are stepping up their efforts to ticket anyone not wearing a seat belt, especially at night. Did you know that driving at night is more dangerous than driving during the day? In fact, the majority (57%) of fatal crashes in Texas happen at night. And last year (2017), of all Texas crashes in which people died and weren’t wearing a seat belt, 57% of those happened at night as well. So whether it’s day or night, remember to buckle your seat belt for safety. You might think that under the cover of darkness, police officers don’t notice unbuckled drivers and passengers. But they do. If you’re pulled over, that means facing fines and court costs up to $200. Instead of putting yourself and others in danger, remember: buckle up day and night, every rider, every ride. We all know we’ supposed to buckle up in the car, whether we’re the driver or a passenger. Warnings of all kinds remind us to fasten our seat belts, including lights, bells, dings, verbal warnings—and sometimes our cars won’t even start until the seat belts are fastened. But what about other people who are sometimes in our cars? You know, the people or children in our back seats. 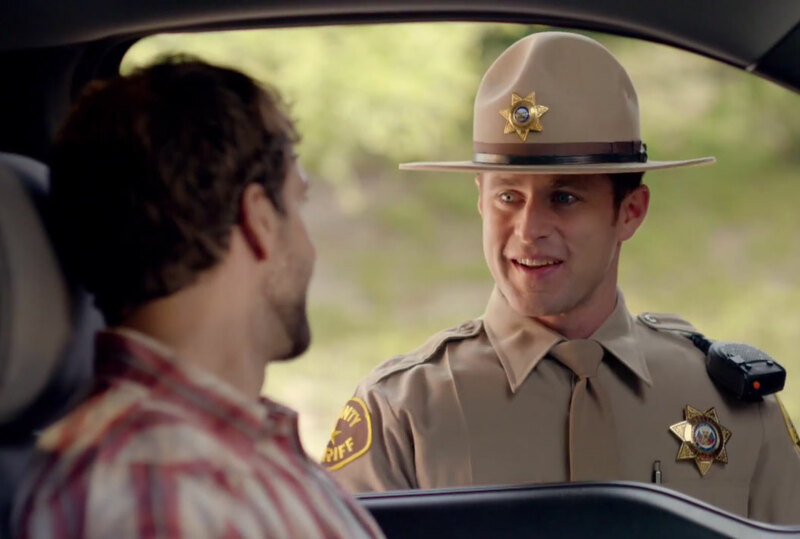 Are there any bells, dings, and warnings to remind rear passengers to buckle up? Not necessarily. State and national data back up TxDOT’s “Click It or Ticket” campaign, which focuses on the laws mandating drivers and front and rear passengers to buckle up. Unbelted backseat passengers can become projectiles in a car crash. They can be tossed around inside the vehicle and can even injure or kill those in the front seat. Riders in the back seat who use lap and shoulder belts are 44 percent more likely to survive in a crash than unrestrained occupants in passenger cars. In passenger vans and SUVs, the likelihood increases to 73 percent. In 2015, there were 2,369 motor vehicle traffic crashes that involved unrestrained occupants who sustained fatal or serious injuries. Overall in 2015, 3,518 traffic fatalities occurred in our state. In 2015, of the 467 pickup truck drivers killed in Texas in a traffic crash, 216 were not wearing a seat belt. 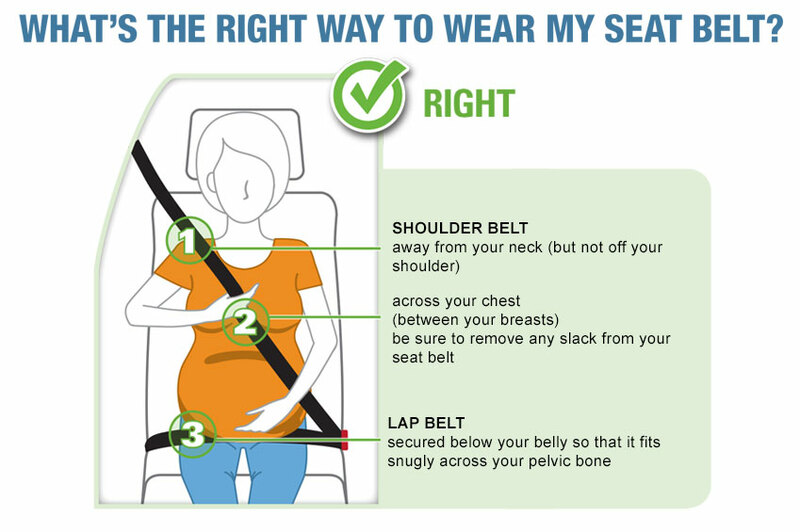 Whether you are in the front seat or back, wearing your seat belt is the single most effective action you can take to protect yourself and your unborn child in the event of a crash. 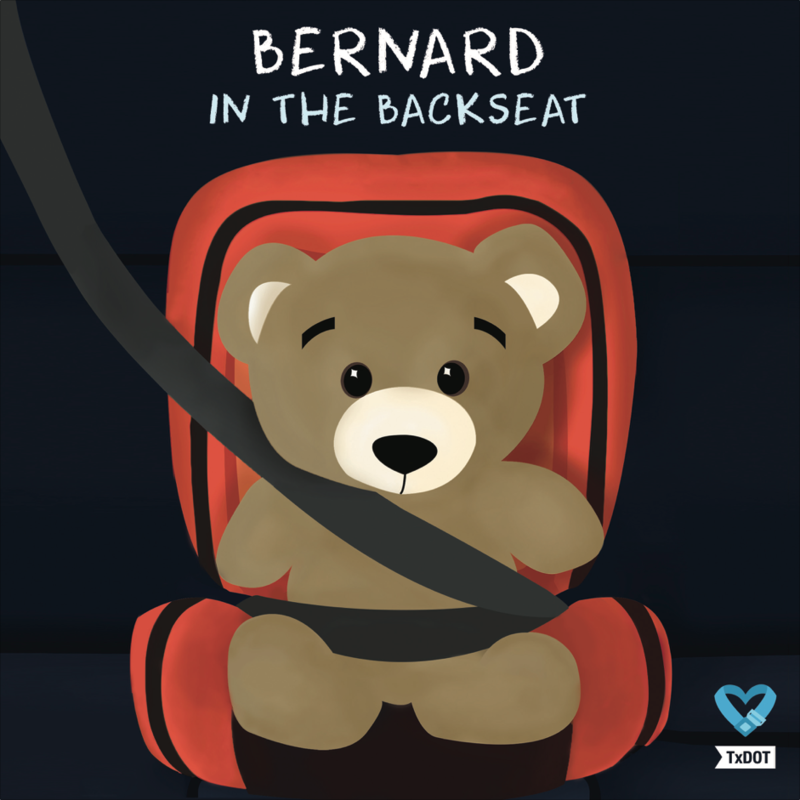 Being buckled up helps keep you safe inside your vehicle during a crash. If you ride without a seat belt, you could be thrown out of your car or collide with other passengers. Secure the lap belt below your belly so that it fits snugly across your hips and pelvic bone. Place the shoulder belt across your chest (between your breasts) and away from your neck. The Click It or Ticket enforcement mobilization is taking place all over the state from May 18th through May 31st, 2015. 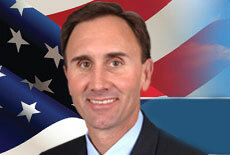 Law enforcement all over Texas will be stepping up their efforts to ticket motorists who are not wearing a seat belt. Whether you drive a big pickup truck or a tiny sedan, no one is above the law. Your seat belt is the single most effective safety device in your vehicle. If you’re traveling at 50 mph and stop suddenly, your unbuckled body will keep moving at 50 mph. Your seat belt is designed to keep you from being thrown into the dashboard or windshield — or even onto the road. Airbags can be big lifesavers. But without seat belts, they can be ineffective and even dangerous. In a crash, seat belts ensure you’re not thrown into a fast-opening airbag—a force that could injure or kill you. Driver or passenger, front seat or back, state law requires everyone in the vehicle to be buckled up. Not buckling up could cost you up to $200 in court costs and fines. Or even worse, it could cost you your life. Who Still Won’t Click It? When the “Click It or Ticket” campaign began in 2002, more than a decade ago, only three out of every four Texans buckled up. Texas currently ranks seventh in the nation for overall seat belt use, and 94 percent of Texan motorists now buckle up. But who is still not buckling up? – Men use seat belts less often than women. – Teens and young adults are not wearing their seat belts. – Passengers are less likely to buckle up than drivers. – Pickup truck drivers are less likely to buckle up than other drivers. – Pickup passengers are the LEAST likely to use a safety belt: Only 80 percent of pickup passengers buckle up compared to 92 percent of passengers in all other types of vehicles! Whether you’re the driver, front seat passenger, or back seat passenger, you have to buckle up. It’s a state law. And not doing so could cost you up to $200. Want an even better reason? Your seat belt is your number one best defense in case of a crash. Texas law requires drivers and all passengers in a vehicle to be secured by a seat belt. Yes, that means unbuckled adult passengers in the back seat can face fines and court costs of up to $200. 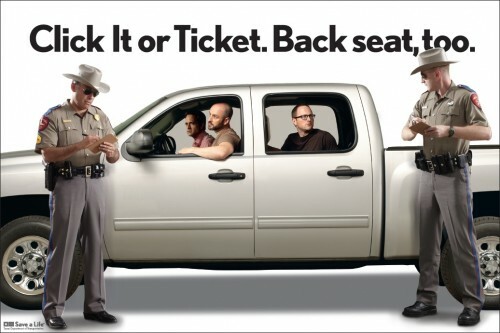 The 2014 Click It or Ticket enforcement mobilization is taking place all over the state from May 19th through June 1st, 2014. Police officers will be stepping up their efforts to ticket motorists who are not wearing a seat belt. Whether motorists live in a city, the suburbs, or a rural area, local law enforcement will be out in force. According to the National Highway Traffic Safety Administration (NHTSA), in 2012, 13,268 traffic fatalities occurred in rural locations. Out of those fatalities, 54 percent were not wearing their seat belts. People who live in rural areas believe that the close-knit nature of their small town will get them out of a ticket. However, motorists should not think that knowing the officer who pulled them over will help them avoid a ticket. Cops are cracking down everywhere on those not wearing their seat belts. Be sure to buckle up or face a fine. For more information visit www.nhtsa.gov/ciot.